A top-10 pharma company was launching a product within a new therapy class treating rheumatoid arthritis. The class represented a clinical improvement over current treatments on the market, so accurate value based pricing research was vital. The client wanted to know whether it could increase revenue by pricing lower to gain access to earlier lines and pooled patients who have not yet progressed to advanced therapy. In order to understand how optimizing price could increase revenue, the client also wanted to know what was driving value for its product versus the competition. Forecasts of brand uptake rates. Whether the product would launch first within the new class, or a rival product would launch before it. This would affect optimal pricing strategy (depending on the competitor’s price) and market share. Biosimilars of the standard-of-care treatment were launching, affecting treatment prices in the therapy area and the product’s pricing prospects. The future price of biosimilars at the product’s launch was unknown. The client also wanted to know what was driving value for its product versus the competition. Understanding pricing prospects and potential demand across each treatment line. Understanding product attribute contribution to product value for the rheumatoid arthritis market. The product’s label was not yet finalised (e.g. severe patients only or moderate and severe patients; combination only or mono and combination). Price-demand curves and market share estimates had to be estimated across the different possible labels, as well as across the different lines; a level of segmentation that traditional conjoint struggles with. The exact product profile was not yet finalised so it was necessary that price-demand curves and market share estimates were able to be adjusted to account for changes after the research phase was complete. By clicking on the “Submit Request” button you are providing consent for us to store your data and contact you. You may withdraw your consent at any time by instructing us at ku/oc/noitamrahpni//ofni. 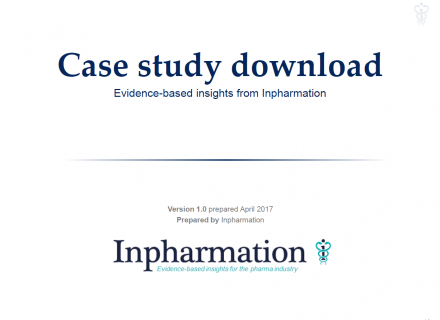 Please note that Inpharmation literature and case study materials constitute Inpharmation intellectual property and are intended for the pharmaceutical industry. Inpharmation is under no obligation to distribute these materials to non-pharmaceutical industry employees or competitors. Thanks! We have received your request and your information will be with you shortly. If you would like to speak to us, please phone +44 1494 68 20 80 or fill in the form on our contact page and we will contact you. Alternatively, you can email us at ku/oc/noitamrahpni//ofni. Inpharmation’s services fit flexibly with your specific requirements.